Glamour, glitz, high profile guests, and photographers are what immediately come to mind when thinking about a Red Carpet theme party! This style of party requires panache, careful thought and deliberate measures to simulate being on the red carpet at a huge premier, celebration, gala or opening to an event. 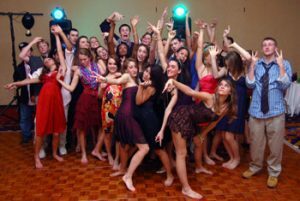 A birthday party can warrant a red carpet style party, especially a sweet sixteen party! This article will cover the main aspects of planning a red carpet themed party including where you can buy a red carpet runner, resources, pictures and ideas for taking a party like this to the next level! Red Carpet Dress, What to Wear? Dress to impress is the mantra for a Red Dress Party. You and your guests should be dressed fashionable, looking good, without being too formal. Guests should be asked to add their own flair or style to their dress, this encourages your guests to get into the theme before they even arrive at the party. This helps them get into the mindset. The host of the party should look amazing, red and black dresses, suits, ties can all look bold and powerful. Anything you would want to wear when getting your picture taken alot! Food should be kept to simple snacks and easily handled Hors Douerves at the beginngin of the night. These can be continued throughout the night. Heavy foods should be avoided unless there is a formal sit down dinner that is part of the evening. Foods should be avoided until after the pictures so everyone is looking their best at the beginning of the night and no one has any food stuck in their teeth for photos. Drinks are an important part of the red carpet, it’s a big event and should be celebrated with champagne or sparkling apple cider. Having a limited amount of drinks to elegant champagne flutes with some kind of bubbly drink will help keep everyone in a good mood and in the celebratory spirit. Decorations can be handled a number of ways. The most important is making sure you have a red carpet secured and booked for the night. These can be found through local equipment companies or production companies. 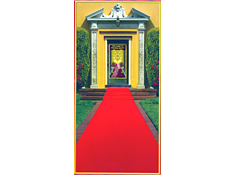 Some locations have red carpets available for rental. You can buy a red carpet runner that will work great for your party right here for less than $10! Make sure it’s long enough to reach the street so once a person arrives they can walk all the way in on a red carpet, make sure to measure the distance before you order the carpet. Lifesize custom cardboard cutouts can be a great way to have guests arrive and find a cutout of the party host or famous people they can pose for pictures with. This can be a great way for your guests to break the ice once they arrive and get them in the mindset of looking good and posing for photos. Hiring a local actor to play a famous person who interviews guests on camera can be a cool way to create a memorable evening but also to create a way to remember the event by catching all of your friends on camera as they arrive. When you watch a red carpet event on TV, they place strobes in the audience to simulate photos being taken. This helps get the energy up so it always looks like people are getting their photo taken even though they may not, it looks great and can help juice up the energy for an event. They sell mini-string strobe lights that that are great for this purpose. Turnstyles are also necessary to keep your friends and guests on both sides of the rope so that when people are on the carpet it is their time to shine. Have your guests arrive and make their way down the carpet. At the end have them register for the party, pickup a drink, and join the guests to welcome your other guests as they arrive. Encourage them to take pictures and cheer and welcome guests as they arrive to your party. Then right as the host of the party arrives, all your guests are happy and waiting right there for you to get the party started! High energy music is crucial to pulling off this type of event. Get some speakers outside, and play the latest music as well as some club/lounge music to get everyone in that chic and glamourous mindset. Here is a great selection of club music through Amazon that would be perfect for this type of an entrance. Photographers are crucial for pulling off this type of a party and entrance. Making sure that you’re friends bring their cameras is important. Hiring a photographer and an assitant would be a great way to get that glamous feeling. Make sure to tell your photographer what kind of party it is so they can dress appropriately. When your guests arrive you’ll get a great professional quatliy photo of them to keep and they’ll love the fact that they get a really great picture of themselves looking their best. Throughout the night make sure they work the room taking everyones photos. Guests should have a gift bag that they get to keep from the night. It should be filled with an assortment of things to take home. Giftcards can be great, pictures of yourself, a card to the link where the photos will be after the event. Candy can be a great addition to goody bags as well, buy personalized chocolate bars allow you to put your picture on them to customize your party even more. Including a branded item like a key chain can also be a cool way for your guests to remember the event. A red carpet theme party can be an awesome theme! The glamour of the evening, the fun music, photography, and video can make it an awesome experience for you and your guests. 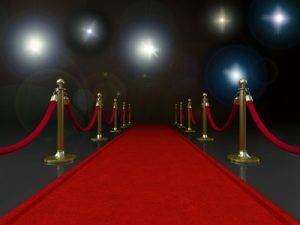 You can throw the party around various purposes, you could have an award show, birthday party, or any other type of event that would warrant the red carpet treatment. Remember, have fun, make it big and be glamourous!